Let cookie dough stand at room temperature for 10 minutes to soften. Meanwhile, heat oven to 350°F. In large bowl, break up cookie dough; add marmalade and pecans. In small bowl, mix flour, 1/4 cup cocoa, coffee granules, cinnamon, cloves, allspice and red pepper; stir into dough mixture with wooden spoon until well blended. Shape dough into 24 (about 1 1/2-inch) balls. On ungreased large cookie sheets, place balls 2 inches apart. Gently press 1 espresso bean into center of each cookie. Bake 9 to 12 minutes or until tops are cracked and edges are set. Let stand on cookie sheet 1 minute; remove to cooling racks. Cool completely, about 30 minutes. 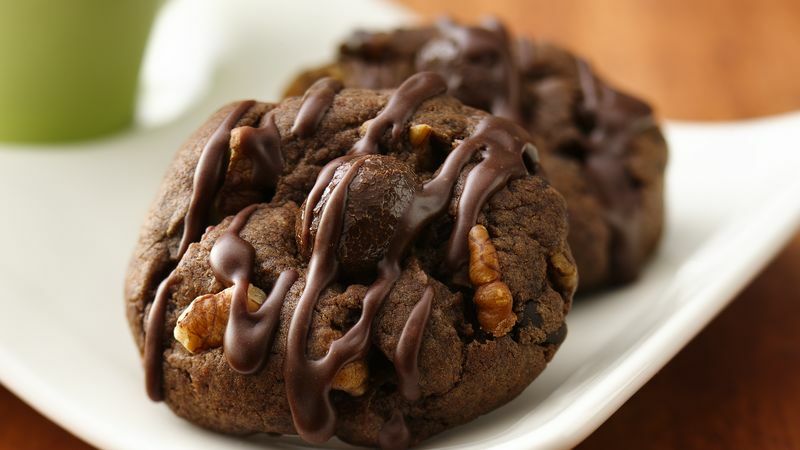 In small bowl, mix powdered sugar, milk and 1 tablespoon cocoa until smooth and well blended; drizzle over cookies. Let stand about 15 minutes until set.